We’re going to be gathering a flood of British GT news on Wednesday, at the British GT Media Day at Silverstone – but ahead of that, here’s an interesting Cup Class item, involving some familiar names. Andrew Howard’s Team Beechdean will be entering a Ferrari 360 in the Avon Tyres British GT Championship, for Nigel Greensall and Jonathan Coleman. 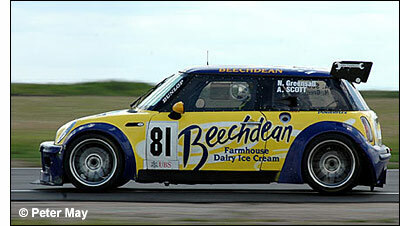 Howard is the founder of Beechdean Dairies Ltd., and the ice cream manufacturer’s colours have been a familiar sight in the Britcar series - notably adorning the MINI that ran last year (for Aaron Scott and Nigel Greensall). Now it’s GT car time, with the Ferrari to be backed by Beechdean, Royal Purple Oils and Teng Tools. Greensall and Coleman are a familiar pairing anyway – in the Norma last year (in the VdeV series), in Radicals and in one of the RSR TVRs in 2004. The team’s first test will take place next month, ahead of the season-opening event at Oulton Park. "We have the car, we have the drivers, we have the team, now let’s have some fun," says Andrew Howard.